Ghosts are not very pleased with the living at the moment. To be fair, specters have never been big fans of humans. We can do things they can't, like produce a heartbeat and breathe, while ghosts can only walk through walls and slowly open doors. (Lame.) Anyway, now ghosts are sick of us stealing their accessories. They claim that the top hat is "their" accessory and it's not fair that political figures and snowmen are suddenly sporting "their" dapper headgear (that means you, Uncle Sam and Frosty the Snowman.) But you know what we say? Heck, wear top hats anyway. 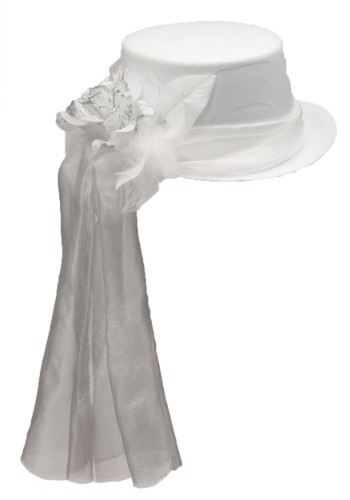 They're too good to pass up, especially this beautiful ghost top hat! Look debonair and newly-dead while sporting this top hat. Wrapped in a cascading silky scarf and featuring a glittery floral decoration and a few feathers, this accessory will elevate any ghoul costume from "basic ghost" to "alluring apparition" depending on what other accessories you choose to wear. Don't worry about poltergeist specifically targeting you while wearing this accessory. Wear it fearlessly and remember, ghosts can't harm the living. If they try swiping it off your head calmly say, nuh-uh ghost, not today, and keep living your best life.